LESS!, one of the most fun book projects I have ever worked on, is now available on Swedish online book stores, Bokus, Dito, Bokon and Adlibris. The book is also available on Amazon, and in hardcover on Lulu. 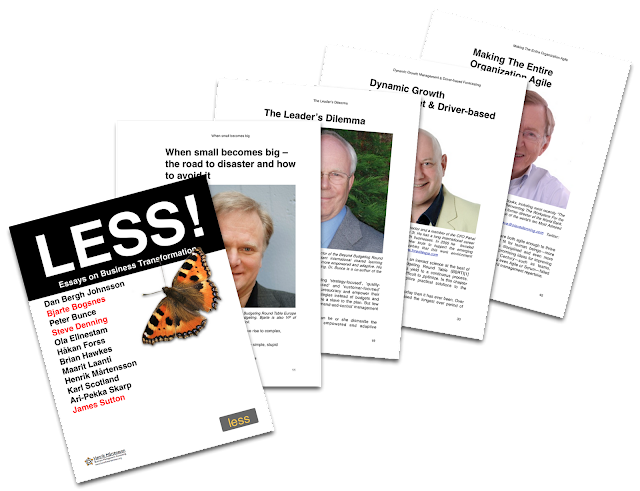 I have blogged about the contents of LESS! in my management blog. Here, I'll write a little bit about the design, starting with the cover. All management books I have published, well, only two so far, use the same basic design with a black field on a white background. I always put something on the cover that has an element of orange. 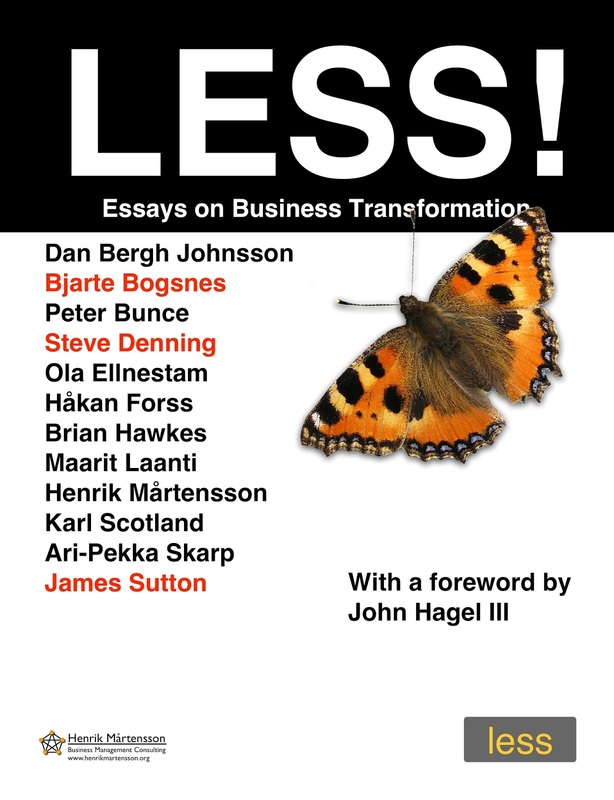 It is important to me that the cover has some link to the contents, and since this is a book about business transformation, what better symbol than a butterfly? 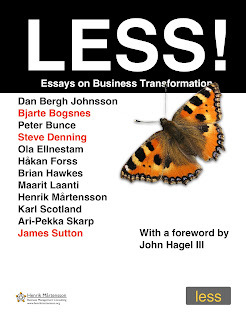 Also, one of the authors (you'll have to read the book to fin out who,) used the lifecycle of a butterfly as a metaphor for business transformation in the book, so putting a butterfly on the cover felt like the right thing to do. One thing I was very careful with regarding the interior design, was to start each essay with a large photo of the author. I wanted readers to meet the authors face-to-face, or as close as we could get. I felt that that would make it easier for readers to trust the authors, and building trust was necessary, because a lot of the things in the book, about budgetless financial systems, short strategy loops, queueing theory, and so on, are controversial. That is also why each chapter starts with a brief biography, helping to establish the credentials of the author. Donella Meadow's System Intervention scale. Managers tend to focus on the low leverage interventions to the left, when they ought to focus on the high leverage interventions to the right. Diagrams were another important feature. We had lots of diagrams! When you set out to explain a lot of complicated stuff, you need to simplify. We used diagrams to do that, and also took care to keep the language simple. I ran all texts through readability index calculators to help ensure that the language itself did not obfuscate the ideas and logical arguments. LESS! is a thought provoking book, and I do hope it can help kick off real improvements in leadership and management practices, and in how we organize and collaborate at work.